A fairly easy walk in great scenery between Lough Tay and Lough Dan. Shame the name of the hill is such a mouthful ! The area around Lough Dan really is one of my favourites – since there are no roads the area is completely car free and has a great feeling of quietness. Knocknacloghoge itself also seems to be a little off the beaten path so its much quieter than other hills around Lough Tay. 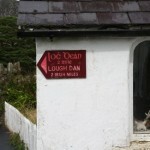 The start of the walk is at the Pier Gates, entrance to Luggala Lodge. Car parking is easiest further along the road (towards Roundwood) where there is a layby on the right. Next to the Pier Gates themselves is a pedestrian kissing gate that leads onto a tarmac road leading downhill. Pier Gates, pedestrian gate is to the left. 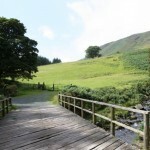 Follow the road past a farm and you will cross two bridges. 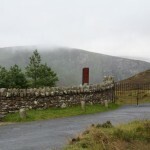 The road ends after the second bridge and there is a gate on the right that leads up to Knocknacloghoge itself. Cross the gate and follow the path up hill to a second gate. Keep going through this gate. On the right a little way on (running across the hill following the line of the bracken) is an old drove road, now a grassy path. Follow the road as it heads up around the side of the hill. 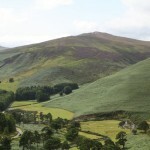 The summit of the hill will come into sight on the left. The road itself continues around the hill without going to the top, so follow the path on the left that heads up hill from the drove road. Take this path towards the summit. This path eventually peters out, but the hillside is criss-crossed with small paths and any of these can now be taken to reach the top. To descend, begin by following the path that leads south from the summit. Bear to the left and keep heading towards the head of Lough Dan (there are cliffs to the right). There are two options for descending. 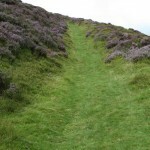 If its late summer and the bracken is thriving (it can be 4 or 5 feet high), then follow the line of the bracken left back towards to the drove road and retrace your steps back to the start of the walk. 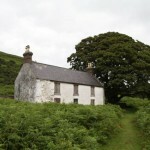 If the bracken is passable, then a nice alternative is to descend towards the cottage at the head of Lough Dan and return left along the old road. 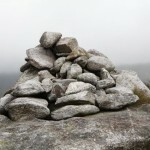 For a much longer walk, its also possible to descend to the south-west towards the Inchavore River and either walk back to Lough Dan along the river, or cross the river at the Copse and climb Kanturk and Scarr. I wouldn’t recommend either of these options though – the descent from the hill is over boggy, lumpy ground, and the path back along the river is similarly unpleasant (with the addition of deep bracken to add to the “fun”). 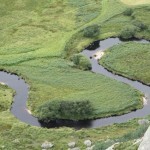 If its been raining the river will also almost certainly be impossible to cross without getting wet. Hello is ti possible walking down to Guiness lake ? Or is it private property and no tresspasing? Or someone make excursions there ? 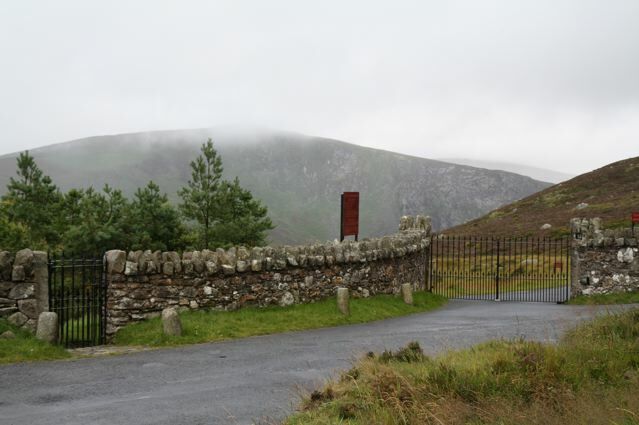 Lough Tay is private property with no access to the public. 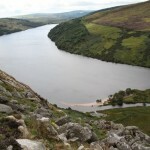 Lough Dan is also private, but the public are allowed access the lake. Just don’t bring any dogs! Brilliant site. Instructions, pics and maps are so easy to follow and give a good idea of what is doable depending on your fitness level. Walked this again recently. Beautiful in the summer, but the route descending SSE from the peak (Knocknacloghoge) has no clear path and is blanketed with gorse/ferns. Best route down towards the cottage seems slightly more easterly than shown on the map (when you encounter gorse, head east until you find a way through). Similarly, once you reach the end of the old drove road on the way up, ascending Knocknacloghoge from the east (where the given map route cuts sharply south towards the peak), there’s no clear path and involves a bit of a scramble through the heather. Really? No dogs? is there nowhere in Ireland to walk where dogs are welcome?